For today’s lust list, I am sharing some of my latest accessory acquisitions and some that I currently have my eye on (quite literally). Whether it is the perfect fringed confection or a pair of swing earrings, each piece would be the perfect companion to any ensemble. Get Fringed: From bangs to handbags and skirts that are meant to move, fringe is one adornment that all of us style mavens should be looking to when it comes to adding some panache to our spring wardrobes. Swingers: Swing earrings and pearls are the latest craze when it comes to ear accessories. 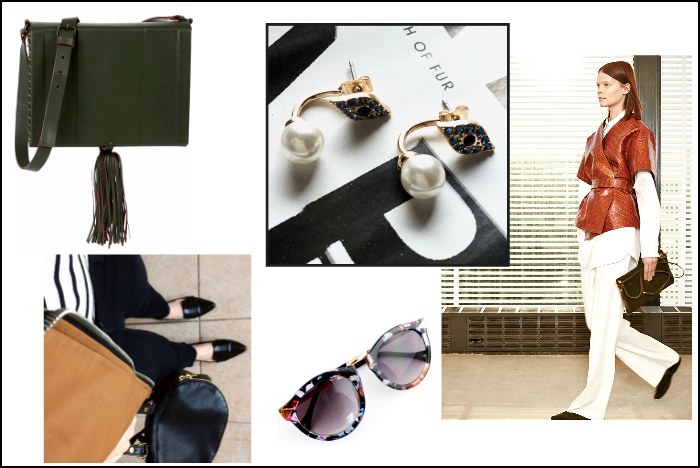 However, I am not the basic, pearl kind of style maven, so these eye swingers also allowing me to explore the trend while adding a bit of edge and touch of quirk to my look. Everybody Was Kung Fu Fitting: The Row’s fall 2015 collection was the definition of perfection. The obi belts and shortened kimono silhouettes made me so very excited for the new season. Thawing Out: My ankles are finally thawing out after a snow storm that had me thinking that spring would never come. Today, I donned the perfect pair of loafers (ankles out and all), a leather backpack, stripes and a huge smile. The Perfect Pair of Sunnies: I may not don a lot of print or color, but I do like to incorporate it when I can, and most of the time I do so with my accessories. These patterned eye blockers from SHEINSIDE are perfection. That fringe bag is so in the list. Great taste. I’m loving those shades! I was just talking about the Row’s collection last night – one of my favorites by the girls! I’m really pumped for fringe- I scored this suede + fringe skirt and I’m DYING to wear it! Great list- I’m all about fringe for spring!! !